Good mornin’ y’all! With the Olympics fast approaching (only 24 days to go! Hooray! ), there’s a lot going on in the world of athletics. I don’t follow the procedures too closely but apparently it’s qualification week – a lot of athletes are making or breaking it in their respective sports’ Olympic trials. Some big names that didn’t make the cut: Nastia Liukin, after her big fall off the uneven bars over the weekend and Dara Torres who missed qualifying by less than half a second (that’s crazy!). Four years ago when the 2008 Olympics were hosted in Beijing, I wasn’t quite the running fanatic that I am now and would mostly watch swimming and maybe some beach volleyball. But this year, I am big into the running events – both short and long distance. Kara Goucher and Shalane Flanagan in the distance and Lolo Jones in the shorter distances are ones I can’t wait to see run. I have some new found respect for people who can run loops at the speed of lightning, since I’m pretty sure I can’t run that fast even if someone was chasing me. The qualifying trials for track, like gymnastics and swimming, also took place over the weekend. There was a photo finish tie in the women’s 100m. They literally could not decide based on the replay images which woman won the second place spot (and chance at the Olympics). Since ties are so rare (I don’t think this has ever happened before) in the world of track and field, there was no procedure in place for how to break it. One of the girls, Jeneba Tarmoh was actually originally given the third place spot, even receiving a medal and taking a victory lap. After reviewing the photo finish though, the committee decided there was no way to determine who actually won the race – now what? Well, they left it up to the two girls to decide how to settle it (that is absolutely absurd, in my opinion). I think a coin toss was discussed (can you imagine your Olympic chances being decided by a coin flip?) but they ended up deciding on having a run-off. That’s all old news – happened over the weekend (I’m just helping you catch up). The real news today is that the run-off was last night. Or supposed to be. It didn’t happen because Tarmoh (the girl who originally “won” the race) elected to withdraw from the run-off, giving the final Olympic spot to her teammate Allyson Felix. She said her heart just wasn’t in the race anymore and felt that she had been robbed of a spot she believed she rightfully earned. If you were Tarmoh what would you have done? I would have run like hell for my spot on the Olympic team. Who will you be watching in London? What are your favorite events to watch? Newsday Tuesday: St. Jude Half at 85%! Happy Tuesday Y’all! As most of you know, the St. Jude races in Memphis in December are my favorites of the many races I’ve completed in the past few years. I’ve run the full marathon twice (2008 and 2010) and the half-marathon once (2011). When the registration officially opened two weeks ago, I jumped right on it. If you’re thinking of running the half, you best jump on it too, it’s already at 85% capacity! I guarantee that the half-marathon will sell out, QUITE POSSIBLY TODAY. Last year it took just a little bit longer, I think it was sold out by mid-June. IF you miss the regular sign-up, you can still participate as a Hero but you must pledge to raise (or give) $500 for St. Jude. IF YOU WANT TO REGISTER DO IT NOW!!! CLICK HERE. My plan this year is to run the half-marathon again. I set my 13.1 mile PR last year at 1:47:36. I’m hoping that although I won’t be in Memphis for the training this year, the hills of Austin will help improve my speed! No full marathon for me again yet, although I do plan to run at least one more! 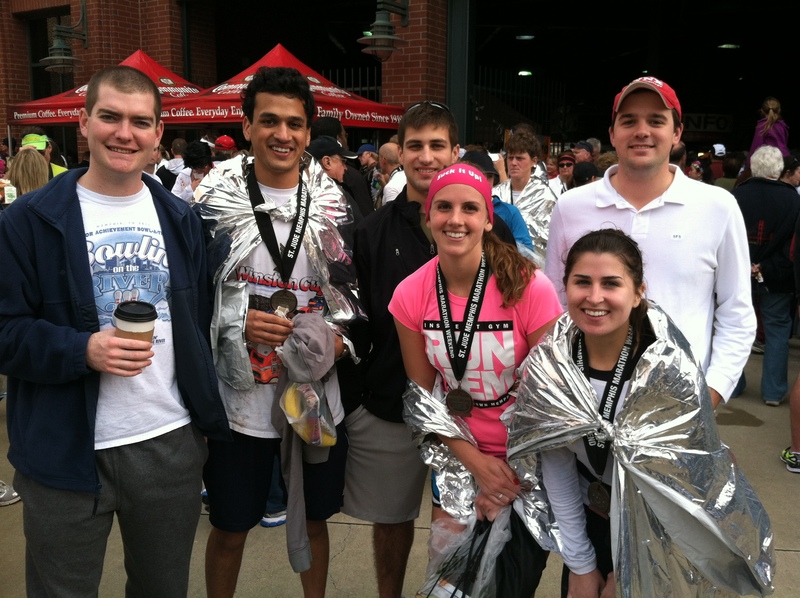 I’m not sure if I ever posted this on the blog so for anyone considering taking the leap to the FULL marathon, here’s how my first one went in Memphis! Mile one was chilly – two layers on my head, four on my top, two on my bottom and one on my hands, but cheerful. People chattering and laughing and cheering as our feet pound the pavement. I’ve started my first marathon, there’s no going back now. Mile two was a little warmer and takes me down along the Mississippi River towards the bridge. I can feel the heat start to settle in all my layers and manage to remove on layer on my hands and top. The streets are already littered with articles of clothing and lined with people cheering us on. Before I know it, I’ve made it to Beale Street, which is much cleaner and less chaotic during the day than when I normally experience it after hours. I catch my mama in my big Rhodes sweatshirt cheering me on with my aunt in front of Silky’s and drop off those layers. I hit mile three and stop for my first water, realizing quickly how pointless it would be to try to run and drink at the same time. More water ends up down my front than in my mouth so I stop for just a sip and then pick it up again. Powerade is in the Coca-Cola cups, water in the white. The fourth mile goes right past St. Jude and there’s a band playing outside the fire station. By this point, I’ve (illegally) put in my headphones and am looking forward to the familiar stretch of North Parkway. At mile five, there’s a sign on a tree – “Kelly – will you marry me? Answer at the finish!”, and as a girl, I naturally pretend that I’m Kelly and I’m excited for her. Then anger sets in – who asks someone to marry him, then makes her run 8 or 21 more miles to answer?! At least she had something to think about for the rest of the miles. Mile 6 is on the bridge over I240 and I stop for my first half of a GU pack and some water. It’s hard to open the Gu and squeeze it into my mouth while standing on a bridge that feels like it’s moving, either because of the runners on it, the flow of traffic below it or my delusional self. I manage to refuel less than gracefully, but according to the plan, so I keep running. This stretch of North Parkway has plenty of signs attached to trees – “Go Mom Go! We Love You” and “What are you running from?” I try to read them all, and then drop one layer off with Pete at his house and get a quick word of encouragement. I’m looking for Katherine at mile 7. She’s promised to be there in her formal dress and heels. The Deltas were doing their charitable duties at a water station despite having been to a formal the night before. Chip was there too in fact, he’ll be in big trouble if he doesn’t make it out to cheer. She wasn’t at mile seven, so I keep running. I eventually spot Lyndsay, Koko, Chip and Samson at Snowden. I consider running over to them to say hi and hug but decide to keep running. Mile 7 – all smiles! I get to mile 8 and see the beloved Deltas. I sneak a quick hug from Katherine, not in her dress as promised but I’m so glad to see her that I overlook it. Eight and nine were inside the park and very scenic. I notice a tingling in my right foot but run on. More than a third finished! I catch the InsideOut crew – Lisa, Donna and Kiersten for the first time in the park. Lisa and Donna have cameras and I give my best fun/triumphant pose. Thinking of Kiersten keeps me occupied for the rest of Overton Park. This year she completed an Ironman Triathlon and won her age division. She’s run in multiple marathons and is someone I look to for fitness inspiration. Mile 10 and 11 are a long, straight stretch down Poplar but Chris is going to be at Angelus, right past mile 10. I run past Angelus and he’s not there. Maybe he’s at McNeil with Marc and Jeff. Get to McNeil and still don’t see them. A little disappointed, I cheer myself up by convincing myself it’s because I was running faster than I anticipated and they just missed me. Eleven goes right past another children’s hospital – LeBonheur. There is construction underway for a new wing of the hospital and the kids’ faces are blown up and cover the fences for that entire block. Seeing the smiles and hope on their faces was like having twenty more cheerleaders on the run. My energy was instantly re-filled. If they can fight, I can absolutely finish this marathon. Someone trips on the trolley tracks in mile twelve and I’m thankful it wasn’t me! She hops up and keeps running while I squeeze down some more Gu. At mile thirteen, there was a big sign pointing the half-marathoners towards their finish line and the full marathoners down the road to the second half. It absolutely crossed my mind to turn, but with the encouragement of fans on the road, I choose the path less traveled. Suddenly, it’s just me on the course. The tingling is in both feet now but I dismiss it. I’m halfway there and headed back down Beale Street. I’m feeling confident but aware of aches and pains. 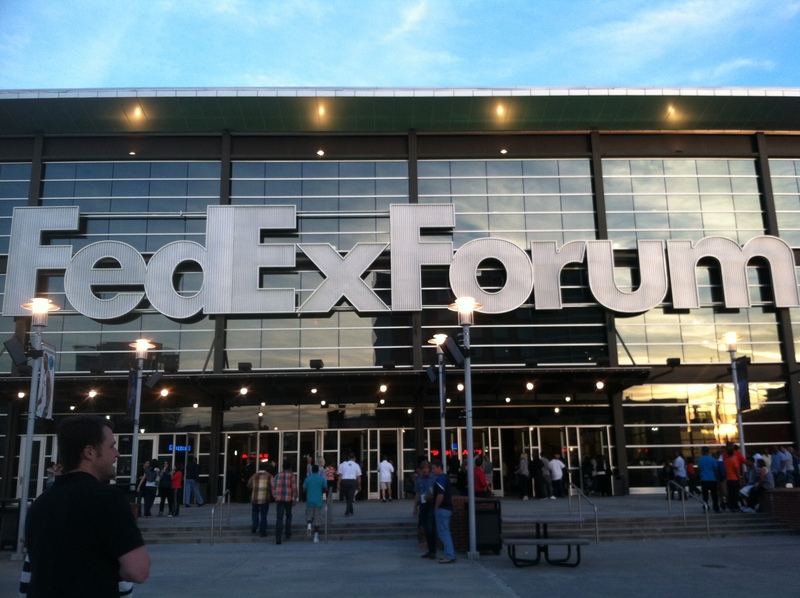 I’ve run mile 14 past the FedEx Forum plenty of times during training and am familiar with the big hill by the parking garage. I didn’t enjoy it during the training or the race. I find my mom and Christi again at mile 15 and stop for a quick hug this time. More Gu and water and I’m off again. Looking forward to the roomies! Mile 16 and 17 are another familiar part of my three and eight mile trails and I like to look at the houses and pretend what my life would be like in each one. The pain in my feet is bad and unfamiliar. I’ve heard stories about people breaking bones when they run but not being able to feel it. In my seventeen-mile state of mind, I decided I had snapped one of the tarsals in my foot. The identifying of that bone leads to the identifying of the rest of the bones in my body: thank you comparative vertebrate morphology. Somewhere back in this stretch there’s a beer and candy stop and I get a little chuckle out of it. I thought about stopping for a quick drink but considering how dehydrated I was and what a lightweight I am…..I decided against it. The InsideOut crew was on this patch too. It’s amazing how helpful and uplifting familiar faces are. That gets me to eighteen and some more Gu and water – still on the every three miles plan, it’s working well. Then, there are my three roommates. These are my best friends, my drinking partners, my sisters. They will be my wedding party, my children’s unofficial aunts and my escape when life gets overwhelming. I love y’all. See you again in three miles. Now it’s one foot in front of the other. My pace has slowed way down and I’m struggling to find songs that keep me going deep in the heart of Cooper Young. I eventually settle on GirlTalk as I make the turn off of Young onto East Parkway. Mile 18 – hugs for the girls! The miles are getting longer now and I’m running with a fairly consistent group of strangers. I have this antsy feeling too. Get me to the next multiple of three so I can have water and Gu, get me to Rhodes so I can see familiar faces. Get me to the next damn mile marker. On and on. Thinking about that gets me to the nineteenth mile. I’m stopping for water at every mile now to help break up the run but every time I stop to drink, it gets harder and harder to pick up running again. I’ve done this so many times I tell myself and manage to hit the road again. We’re in the street and the cars are in the right lane coming at me. There’s a lady on her phone, a man passing on my right, someone walking on my left. And here I am in the middle, still running my first marathon. Finally I can see the corner and make it to the intersection. I had started off thanking all of the officers at the intersections but this one I just didn’t have the energy for. When I saw Andy, Cory and Christ, I was so overwhelmed that I just ran to them and gave them all a hug and kiss. Where are the girls? Where’s the camera? We need a group picture, y’all are supposed to be in it…..Jess! Don’t stop running! Run with me, please, please run with me -we need a picture. And they did. The three of them ran with me from East Parkway to McLean. Cory in his jeans, Andy on the phone with “Bunyon” (Katherine) telling her to run fast in her Uggs. Chris telling me in between breaths how out of shape he is. Andy chanted “You are the Sprenkel, the might might Sprenkel…” I tried to talk to them but they wouldn’t let me, I needed to save my breath. I stopped at 21 for a Gu and water and the boys were fascinated by the Gu, Powerade first, water second. Twenty-one was a big marker because every step I take after this is farther than I’ve ever run in my life. I keep telling the boys that. We’re running still and McLean is getting closer. I’m looking for my cheerleaders and then, there they are. Hooray! I stop for a quick picture with Chip, Koko, Audrey, Lynds, Kelly, Samson, Marc and the running boys. It turned out to be my favorite photo and worth the extra seconds it put on my time. I can’t stay long though because I might not start running again. My thoughts turn to mile 22. A little further down North Parkway, I literally run into Meredith, enveloped into a great big hug. She runs with me for a little while, cheering me on with her contagious energy. Also a Delta, she is quite dedicated for being out there the morning after a formal. I get to my Mama again at mile 23. It was easy to see her in the bright red Rhodes sweatshirt and I held back tears as she ran with me (“run” is not in her vocabulary, except when referring to me or my dad) a few blocks. I dropped my iPod off with her and continued on, promising to find her at the finish. My aunt Christi found me at mile 24 and in her puffy jacket and green scarf, helped me make it down the rest of North Parkway (that’s a long stretch!). ALl my thoughts were on taking the next step – one, two, three, four , five, six, seven, eight….one, two, three…..
She was still with me at mile 25 when we reached the heart of the city again. Still taking tiny sips of water at every mile but it doesn’t help the ache in my bones. My legs are stiff and begging for relief. Crid helps pull me up a tiny hill (literally tugging on my arm) and the runners around us are cheering us on. She jokes that people will think she’s been running for the previous 25 miles and she looks pretty damn good! She has to leave me shortly before mile 26. Once a marathoner herself, life happened. I climbed the rest of the last cruel hill right after mile 26 (not really that long at all, but seemed huge. I just rolled my eyes) I’m trying to think of anything to keep my mind off of actually running. It drifts to the festivities of the evening. Chip is taking me to his formal….I’ll wear my new purple dress….are we dating yet?…..almost there……definitely can’t wear heels tonight…..where’s the damn stadium?….I need a nap….come on Autozone…..I want a hot bath. And then – there it is! I can see the stadium and suddenly I perk up. I know there’s less than .2 miles to go since I just passed the final mile marker and I turn into the stadium. The last few hundred yards are actually on the baseball field. I can see someone not too far ahead of me and try to catch him. Still an athlete you know. I feel like I’m sprinting thought I’m sure in actuality I’m not going that fast. 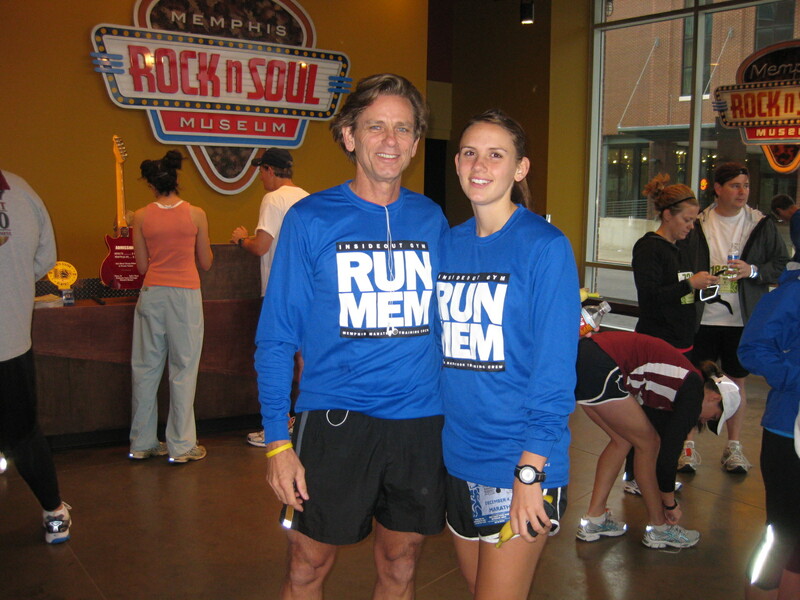 I think of my dad and all of our time running together and wished he was there. He was, after all, the one who got me into this…I’m holding back tears again, just trying to stay on my feet. And then I’m across the finish line!! There was no triumphant breaking of the tape or throwing my arms in the air. But I finished. I was rewarded with a finisher’s medal and a foil blanket and then scolded for trying to walk off with my timing chip still attached to my shoe. Did they honestly expect me to bend over?! I was suddenly aware of the pain and cold all over my body but we managed to get it off an I limped down the chute. I could hear my name coming from the stands. I climbed the baseball stadium stairs (also cruel of the Memphis Runner’s Club) to find the best reward of all – Audrey, Lynds, Koko, Katherine, Meredith, Emma, Courtney and Lacy. They surrounded me in a big hug despite the sweat and salt crusted to my face and my stale odor. THe tears I had been holding back for miles finally came. My mama joined us and I have never felt so loved and supported. Margs for all my supporters! Celebrating at the formal – no heels for this girl! Have I convinced you to run St. Jude yet? A different half or full?! Not yet. But soon! Registration for our (ok, my) favorite half-marathon opens officially on May 1st! Pre-registration is open now BUT beware – you must pledge to raise $2,500 for St. Jude Children’s Hospital. And if you don’t raise that amount in donations, your checking account or credit card has to cover the difference. So, this year I’m going to wait until actual registration opens up on May 1 and have a midnight signing party (similar to a midnight screening of a movie). No matter if I end up in Texas or Georgia and in the future maybe Ireland or Bali, I will always run this race. 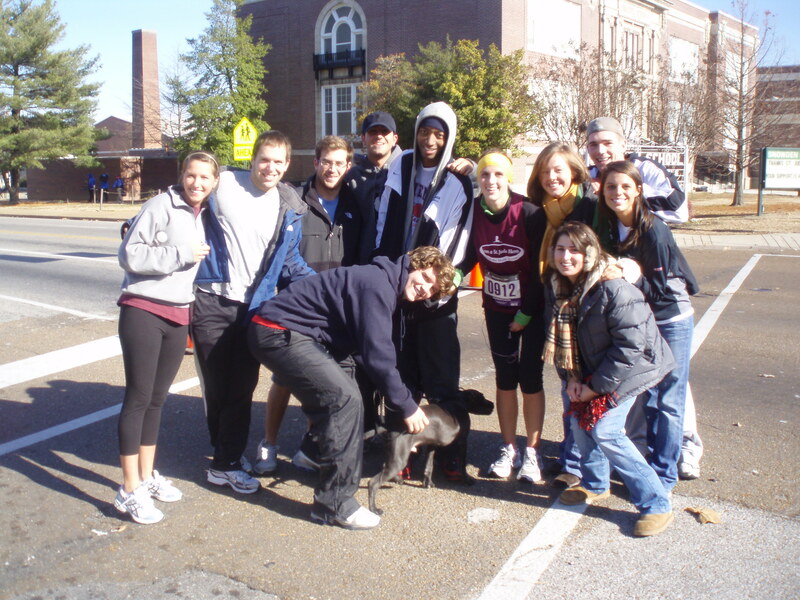 My first marathon - 2008. Will you run St. Jude this year?